What happened to US interbank lending in the financial crisis? An even more dramatic break – before and after September 2008 – can be observed in the behaviour of total US bank reserves. Their annual long-term normal rate of increase between January 1999 and August 2008 is about half a percent. 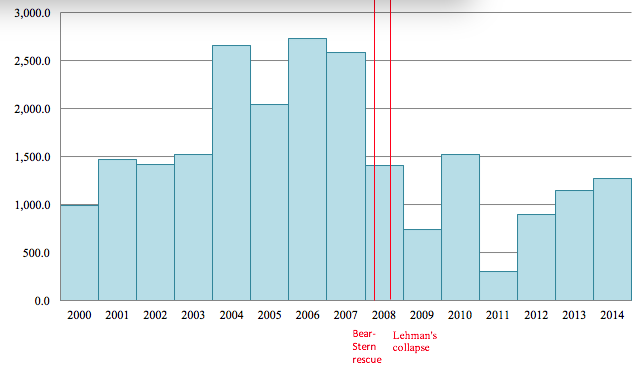 After the Lehman event and up to April 2011, this annual rate accelerated to 100%. 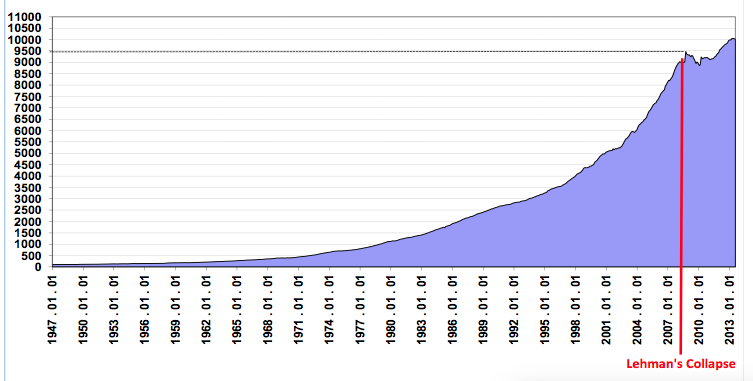 Figure 2 shows the accumulation of US banks reserves after September 2008. At the end of August 2008, total banking reserves stood at about $46 billion. A year later they were 18 times larger! They declined moderately during the second half of 2010, and then increased again by about 60% until the end of April 2012. 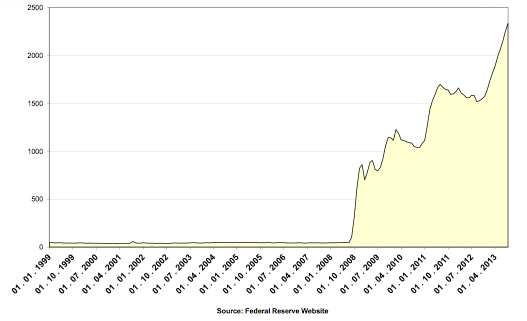 Obviously, this gigantic increase in reserves is largely a mirror image of the quantitative easing operations of the Fed which started shortly after the collapse of Lehman Brothers. In spite of this huge policy-induced increase in reserves, the rate of growth of banking credit remained anaemic. Another way to appreciate the magnitude of the change in the behaviour of US banking credit prior to and after the Lehman event is to compare the ratio between their total reserves and their total credit before and after this event. For a sustained period of time and up to 31 August 2008, this ratio did not deviate much from half a percent. 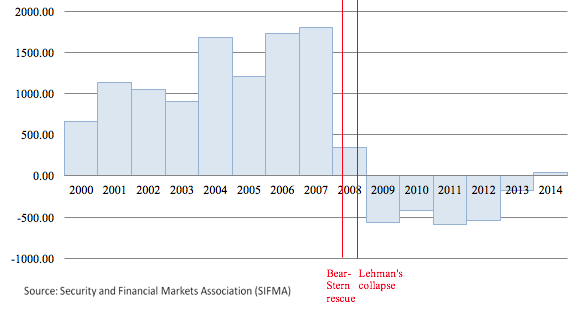 As illustrated in Figure 3, it shot up dramatically immediately following Lehman’s demise, reaching 12.62% on 30 November 2009 (a 24-fold increase in the ratio). Thus, in spite of a huge policy-induced increase in reserves, post-Lehman banking credit growth was minimal and even negative over 2009. Source: Bloomberg - Ticker: ALCBBKCR Index and Federal Reserve website. A substantial part of credit flows in the US occurs through bond issues in the capital market.3 The banking credit evidence presented above is complemented in what follows by data on net new issues of bonds along with net new credit flows via the banking system. 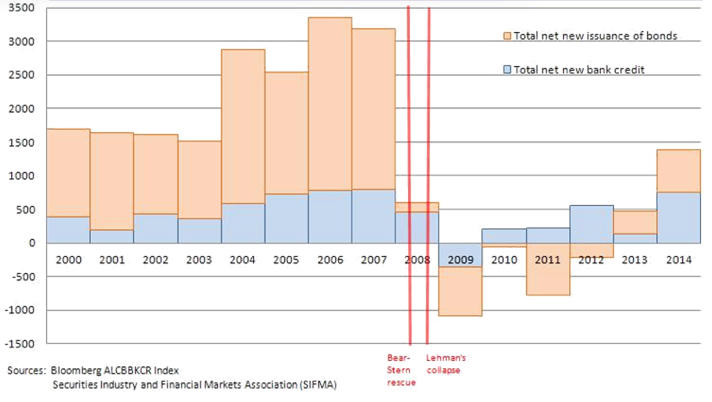 Figure 4 shows the yearly volumes of total (net of redemptions) new bond issues excluding treasury bills (in orange) and net new banking credit flows (in blue). 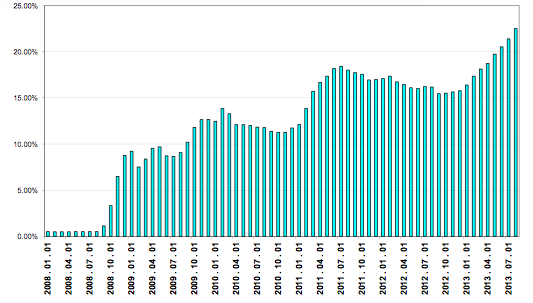 The yearly data in Figure 4 highlight the huge decline that occurred in the grand total (through both the capital market as well as through the banking system) net new credit flows between 2007 and 2008. Most of this decline is due to the collapse in net new issues of bonds that went down from over $2.5 trillion in 2007 to a small positive number in 2008. Net new banking credit also experienced a serious decrease of ‘only’ 47%. However, in 2009 both net new bond issues as well as net new banking credit were in negative territory. By contrast, the time path of net new issues of corporate bonds is quite different. Although those issues decreased from about 400 billion in 2007 to less than 200 billion in 2008, they actually increased to roughly 500 and 600 billion over 2009 and 2010, respectively (Figure 6). However, since the increase in net new issues of corporate bonds was substantially smaller than the collapse of mortgage-related and asset-backed bonds, total net new non-federal bond issues were still in negative territory as can be seen from Figure 4. The dramatic decrease in mortgage-related and asset-backed bonds is due to the realisation by investors in the wake of the Crisis that their ability to measure and manage the risks associated with these types of instruments is substantially lower than what they had believed prior to the outbreak of the Crisis. The increase in corporate bonds during 2009 and 2010 partially reflects a substitution between these defunct mortgage instruments and corporate bonds due to the perceived increase in the relative riskiness of mortgage-related bonds and asset-backed securities. It also implies that the demand for credit by large corporations with good access to the capital market remained substantial in spite of the recession induced by the subprime crisis. The quantitative easing operation of the Fed reinforced this trend through liquidity injections and through forward guidance aimed at keeping long-term rates low. Source: Bloomberg ALCBBKCR Index and SIFMA. In what follows, I briefly sketch the argument that the virtual arrest in total credit creation during the first two years following Lehman’s collapse is consistent with the view that the Lehman event temporarily raised bailout uncertainty and permanently raised the awareness of financial market participants to the existence of low bailout probabilities (which were given zero mass prior to Lehman’s demise). The starting point of the analysis is that prior to the Crisis banks and other financial market participants believed that, in case of financial difficulties, there is a positive and non-negligible probability of bailout. However, they were not certain in the Knightian sense about the likelihood of such bailouts. An increase in bailout uncertainty is then modelled as an expansion of the set of binomial multiple priors distributions. 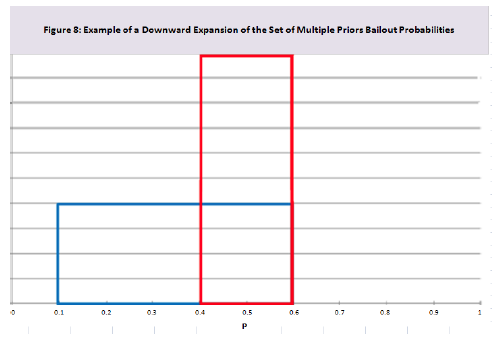 To illustrate, suppose that prior to Lehman’s downfall markets believed that the possible range of P is between 0.4 and 0.6, so that all other bailout probabilities were considered to be irrelevant. A post Lehman increase in bailout uncertainty is then modelled as an expansion of the set of P’s with positive mass to (say) the range between 0.1 and 0.6. This is illustrated in Figure 8.7 More generally, I will refer to sets of bailout probabilities with non-zero mass as sets to which individuals are probabilistically aware of.8 Using this terminology we can refer to an expansion in the set of multiple priors in the direction of lower probabilities as an increase in probabilistic awareness to low bailout probabilities. Based on a set of axioms similar to those postulated by Von Neuman-Morgenstern to derive the expected utility theorem, Gilboa and Schmeidler (1989) show that when faced with multiple priors, individuals should choose the best action against the worst possible distribution (the Maxmin criterion). Continuing the preceding illustration this means, within the Cukierman and Izhakian (2015) framework, that prior to the Lehman event creditors maximised expected utility as if bailout probability was 0.4, and after it, as if it was 0.1. Cukierman and Izhakian (2015) explore the implications of such a change within a 3-sectors general equilibrium model of the financial system and show that it leads to a general contraction of banking credit, a general increase in borrowing rates, and in extreme cases to total credit arrest. The three sectors include ultimate borrowers (firms and households), financial intermediaries (banks), and ultimate lenders such as pension and mutual funds. Lenders lend to financial intermediaries and the latter utilise those funds along with own capital to lend to borrowers. An increase in awareness to low bailout probabilities reduces the expected value of lenders’ returns from buying banks’ obligations and raises the associated risk. Therefore, it reduces the supply of funds to financial intermediaries and increases lenders’ demand for safe assets. This reduces, in turn, the amount of resources available to banks and the volume of credit extended to borrowers. This mechanism operates through an increase in lenders’ and banks’ reluctance to lend. It may be argued that part of the decrease in credit was due to a decrease in demand for credit due to the recession triggered by the Crisis rather than by shrinkage of supply. But the fact that during the first two year after the collapse of Lehman’s Brothers the issuance of corporate bonds actually picked up is consistent with the view that the main reason for the collapse of banking credit resided on the side of supply. Bernanke B (2015), The Courage to Act: A Memoir of a Crisis and its Aftermath, Norton and Company, NY, NY. Caballero, R, E Farhi, and P-O Gourinchas (2016), "Safe Asset Scarcity and Aggregate Demand", forthcoming, American Economic Review, Papers and Proceedings. Cukierman, A (2013), "Monetary policy and institution before, during and after the global financial crisis", Journal of Financial Stability 9, 373-384. Cukierman A (2014), “Euro-Area and US Banks’ Behaviour, and ECB-Fed Monetary Policies during the Global Financial Crisis: A Comparison”, in Money, Regulation & Growth: Financing New Growth in Europe, SUERF Studies, Number 4, 73-90. Cukierman A (2015), “US Banks’ Behaviour since Lehman’s Collapse, Bailout Uncertainty and the Choice of Exit Strategies”, CEPR DP 10349, October. Cukierman, A, and Y Izhakian (2015), “Bailout Uncertainty in a Micro founded General Equilibrium Model of the Financial System”, Journal of Banking and Finance, 52, 160-179. Gilboa, I, and D Schmeidler (1989). “Maxmin Expected Utility with Non-unique Prior,” Journal of Mathematical Economics 18(2), 141-153. Hansen L and T Sargent (2008), Robustness, Princeton University Press, Princeton, NJ. Taleb N. (2007), The Black Swan: The Impact of the Highly Improbable, Random House Group. Chapter 12 in Bernanke (2015) contains a detailed and informative discussion of the considerations that led to the decision not to bailout Lehman Brothers. It shrank by over 3.5% during 2009, temporarily picking up to 5.22% between July 2011 and December 2012 and then slowing back down to 0.76% between January and August of 2013. Over the entire period between September 2008 and February 2014, the rate of growth was 2.01%. The stock of US private bonds is about three times larger than the stock of banking credit. Further detail appears in section 5 of Cukierman (2014). Although they differ in terms of absolute magnitudes, the time paths of each of the components of this sum are qualitatively similar to the behavior of the total. In terms of magnitudes the total sum is dominated by movements in mortgage related and asset backed bonds. Using this type of data, Caballero et al. (2016) argue that world supply of safe assets shrank in the aftermath of the crisis putting further downward pressure on long term safe real rates. Hansen and Sargent (2008) use the idea of multiple priors to explore the consequences of parameter uncertainty for the behaviour of the economy. The probability masses have been drawn as uniform for simplicity. Any two probability masses over P such that the minimal value of the post Lehman support is lower than its counterpart in the pre-Lehman period can be used to convey the general idea of the figure. The adjective ‘probabilistic’ is needed in order to distinguish it from the term ‘awareness’ in modern decision theory. The latter refers to states of natures that individuals know might realise as opposed to states they are completely unware of like Taleb’s (2007) black swans prior to their discovery in Australia. Although Figure 5 assumes for simplicity that the distributions of binomial bailout probabilities both before and after Lehman’s collapse are uniform the arguments in the text do not depend on the particular form of those distributions. Further details appear in section 2 of Cukierman (2015).